Jack (CEO) and Dismas (Head Roaster) are on a coffee buying trip to Central America. These are notes from their journey. At one of the micro-mills. We get to the lab about 9:00am. We have a lot of cupping to do. With so many farms and lots to choose from, it’s a bit daunting. Each table has 48 cups and we cup 4 tables. This is not easy cupping, as there are so many similarities. We have to be watchful of palate fatigue or we’ll make mistakes. At 2:00pm, we wrap up and I hope we are done for the day. Not at all. We jump back in the van and are off to visit more micro-mills. Our guide asks if we want lunch now or when we get closer to our destination: we all say now. Ninety-five minutes later I ask, “lunch soon?” “Well, I decided to go to a better place.” Hah! If there’s anything I always take away from these trips, it’s to stay loose & enjoy the ride. The family of Granitas de Alturra micro-mill. After a lunch with the most stunning view ever (worth the wait), we were back in the van for Granitas de Alturra Micro-mill. This mill is operated by four sisters and was one of my very favorite coffees last year. They greet us with gifts and smiles. After a nice tour, one of the younger women says, “Thanks for buying our coffee, see you next harvest.” Wow. So cool. We visit two more mills and drive back to town. Francisco hosts a big dinner and we eat amazing fish sitting next to the Toby’s Estate buyer (Brooklyn) and the Campos Coffee buyer (Australia). We had a great time chatting about our favorite coffees and of course drinking. It’s another late night, but we go home tomorrow and savor every last moment. Jack inspecting the coffee on a raised drying bed. We get up, pack, grab breakfast, and head to the lab. We’ll be making all final decisions this morning before heading to the airport about 1:00pm. We get there and discuss the things we are deciding on. Fortunately, we only have two tables to cup. After a couple hours, we’ve made our decisions. Watch for Herbazu SL 28 (Kenya varietal), with a cup score of 90; Los Brusmas Geisha natural, with a cup score of 92; El Pilon natural, with a cup score of 88.5; and Granitas de Ortiz, with a cup score of 89. These are the best of the best and I’m so excited to offer them to you, our customers. Dismas and I had an amazing journey. Thank you all for making it possible! This entry was posted in Caffe Ladro on March 5, 2015 by Caffe Ladro - Ladro Roasting. Dismas and Jack in downtown San Jose. We arrive in Costa Rica and head to our hotel. Upstairs, we drop off our things and send a few emails. It’s Sunday, so after lunch we have an afternoon free to ourselves. We grab a cab into downtown San Jose, Costa Rica’s capital and largest city. It’s modern and we enjoy walking the city, looking at churches and the unique European-influenced architecture. The day passes all too quickly and we all agree we’d love more time to explore San Jose. After breakfast, Exclusive Coffees picks us up and we head to their dry mill and lab. Exclusive Coffees is owned and operated by Francisco Mena. He is one of the most passionate and charismatic gentlemen I’ve ever met. We’ve been buying coffee through Francisco for 4 years and we’re happy to see him and his amazing staff again. At its core, Exclusive Coffees is a dry mill; but Francisco has fostered a movement called the “Micro-mill Revolution.” This is when small farms add a wet processing station, making them capable of lot-sorting and drying, two of the most significant steps in achieving the high quality beans the specialty market is looking for. After this processing, Francisco collects, cups, and categorizes all these micro-lots for the farms, then brings in the roasters to taste and buy the coffee. It’s an amazing operation that allows roasters and farmers unprecedented exposure to one another. He is currently partnered with over 90 micro-mills! Jack and one of the farmers. After a few stories and amazing coffee from a Chemex, we plan our day of farm visits. Our first stop is Santa Rosa 1900. This small farm and mill is situated on a high promontory overlooking Terrazu Valley. With excellent elevation and 100% African drying beds, their quality is always stellar. Next up is the famous Don Mayo Micro-mill. This is where we bought our Geisha last year and we are excited to see the farms. We continue this process of micro mill tours late into the evening. After our sixth mill and last stop our host jokes: “How about one more?” Not as funny as it should be. We are beaten down, tired, and a long way from the hotel. Finally back at 9:00pm, we have a bite and drinks and get to bed. This entry was posted in Caffe Ladro on March 4, 2015 by Caffe Ladro - Ladro Roasting. The alarm rings all too early but about 5 cups of AeroPress coffee get us to our flight on time. We arrive in El Salvador very early and Juan Luis, the Ortiz family driver for the last 42 years, meets us. He doesn’t speak much, but his welcoming eyes and smile are the perfect greeting. We hop in the car and drive to Talnamica, two hours away. El Salvador is beautiful with many volcanos that scatter the horizon. Farmer with his coffee cherries. About 10:45am, we arrive at Finca Talnamica, where the Ortiz family home is located. Nena and Hermann, husband and wife who represent the family in all decisions, greet us with big hugs! We have been working with them for over 4 years and have become very close. After catching up, we go inside for lunch. Sadly, our usual caretaker, Tita, is home recovering from surgery. Nena informs us Tita was incredibly upset she couldn’t be there for us and apologized. She is simply the sweetest! So, without Tita, we have lunch and head out to the farm. Miguel Angel is the manager of the farm and is essentially the Michelangelo of Talnamica. His attention to detail is completely amazing and has become the standard for all the Ortiz family farms. We see the harvest in full swing, with the patio full of people delivering cherry, sorting, and weighing their day’s pick. It is a wonderful time and kids are playing and eating ice cream. It’s getting late so we decide to visit Tita. We gently and happily give her a little hug and share some photos. Now our stay at Talnamica is complete. After dinner, we sit on the porch and drink some Flor de Cana rum, discussing the incredible day. It’s breezy and cool. We all sleep like babies. Boy with ice cream at the harvest. We wake up and have a typical breakfast of huevos, beans, and tortillas. We talk of getting to Natamaya, but it isn’t likely we’ll have time. I brought another nice check to present to the remote village Canton Ojo de Agua above Natamaya. We raised almost $2,000 dollars this year! Nena promises to give them the check and to get pictures of the soccer field they built with last year’s donation. We pack up and wave goodbye to Talnamica. Our next destination is CuatroM, the best mill in El Salvador, where the Ortiz family has its coffee prepared. Dana Foster, an old friend, is now the head of quality control and does all the cupping and scoring of coffees. During the harvest, she works 16 hours a day, 7 days a week, for 3 1/2 months! We arrive about 10:30am and Emilio Lopez Diaz, the owner of the mill, greets us. He’s also under a tremendous work load during this time. Not only does he run a very busy mill, but he has Finca El Manzano and is on the executive council of Roasters Guild. We’re cupping the Ortiz coffees so we have ten to consider. We’re looking for a blender coffee for our Queen Anne and Espresso blends and we hope to find some micro lots for our Daring single origin line. The table is very strong, with coffee scoring a full point higher than last year. The micro lots are cupping 86.5 and our blender is a solid 85. The Ortiz family is doing an impressive job! We were their first specialty buyers and now they have many direct trade customers. They used to sell coffee cherry to mills that put all the coffee together and paid a price based on the C market. This year, they would have received approximately $1.25/lb. By selling specialty coffee, they will earn between $2.70 and $4.00/lb. That remarkable increase is allowing them to put more money back into the farms. We enjoy a nice lunch next to the drying patios. It’s an amazing view and if you look at any Caffe Ladro store menu you’ll see it in the background. Next, we tour the Beneficio and walk Finca El Manzano. It’s rewarding and humbling to be this close to the coffee and involved in this amazing process. It’s 6:30pm when we get back to the house for an awesome night with plenty of grilled meats, ron (rum), Cervezas, and—most importantly—lots of coffee stories. Dismas was holding court for sure but I managed a few lies too. Bed came very late! Feb 14, 2015: Dia de los Enamorados. We wake with a start. Bang, bang, bang on the door: “Get up, you’re late! Malacara B is here to pick you up.” It’s 7:20am and we’re supposed to be ready to go in ten minutes! Roberto Dumont picks us up and we head for Beneficio Bourbollon. Roberto is very easy to like: he’s tall, gracious, and doesn’t show his 60-plus years. We drive about 1 1/2 hours to the mill. When we arrive, we greet Roberto’s son, Rodrigo. We’re friends from last year’s trip and he came to the SCAA conference in Seattle last April. We tour the Beneficio and observe evidence of great sorting and quality control, then we sit down to cup Malacara B’s coffees. We’re there to explore their micro lots. From the big table, I choose two standouts that both show astonishing sweetness and balanced acidity. I’m happy to learn the coffees are the orange Bourbon we bought last year and its sister coffee, a yellow Bourbon. These coffees are still being harvested, so quantities aren’t available yet. Hopefully we can get some! We thank Jorge, the manager of Bourbollon, then we jump in the trucks and head for Finca Malacara B. Malacara has a rich history in El Salvador. Rodrigo is a fifth generation coffee farmer. His great grandfather famously led El Salvador into the world coffee market, making the Malacara brand synonymous with El Salvadoran coffee. When Roberto’s father passed away, his mother split the farm into three separate farms, Malacara A, B, and C, giving one to each son. When we arrive, we see a lot of the pickers delivering their cherry to be weighed. While touring the farm, we discuss their pruning and fertilization strategies. New trees take three years to produce cherry. They explain how replanting 15-20% of the land each year is very important since new plants fight the Roya (Rust). Though replanting isn’t cheap, old plants are more susceptible to this fungus. We go for a drive and look at the housing and soccer field they provide for all their pickers. They also provide three meals a day and have a clinic and school for the families. Their workers return year after year. We stop at the original house where Roberto was born and enjoy some delicious soup and pupusas on the porch for lunch. The next part of our journey is a wonderful surprise. Roberto takes us to his house on Lake Coatepeque, in the middle of a volcanic caldera. Eruptions 72,000 years ago left a huge basin in the mountain that’s now a stunning lake encircled with mountains. He treats us to an amazing meal of seafood paella and banana cream pie. While so thankful for the nice break, we must say goodbye and drive back to the hotel. Morning—and our trip to Costa Rica—will come quickly. This entry was posted in Caffe Ladro and tagged Central America, coffee, coffee farm, direct trade, El Salvador on February 25, 2015 by Caffe Ladro - Ladro Roasting. Coffee cherries at Mama Mina. This day started just like every coffee buying trip: early! We woke at 4:00am, went straight to the airport and, after a long day of travel, we finally arrived in Managua at 10:00pm. We grabbed our bags and jumped into a shuttle, which literally drove across the street to our hotel. Dismas and I headed to the bar for the customary piña colada, then were off to bed. We got up early with a nice breakfast and jumped into the Mierisch shuttle, which drove us to Beneficio Don Esteban. This is where all Fincas Mierisch farms deliver their coffee for dry processing. Eleane, the daughter of Dr. Erwin Mierisch, is head of operations. It’s her dedication and attention to detail which keeps the farms performing year after year. She greets me with a big hug and smile: “Long time no see!” Then her brother, Erwin, and father, Dr. Erwin, come out and say hello. I know them well and hugs are passed around. This is our fourth year working with them. They take Dismas and me on a tour of the Beneficio as we discuss advancements and challenges. At 2:30pm, we returned to cup coffees. The first table had 10 coffees (40 cups to taste). This is what it’s all about and the table didn’t disappoint! The best coffee was a sweet, tropical Javanica pulp natural that scored 89 points. Another coffee we’re thrilled with is Ethiosar, a hybrid varietal the family created from an Ethiopian, Sarchimore, and Villasarchi. It was amazing. We also bought a natural Pacamara that will be one of the most exciting coffees of the season. The next table came and although it didn’t have as many great coffees, it showed wonderful range and I purchased two more micro-lots. At 6:15pm, we headed back into Matagalpa for dinner, then hit the bed at 10:30pm. A fun but long day for sure. Truck ride through Mama Mina. Another early start sees us spending most of the day bouncing around terrible roads, but touring the most amazing coffee farms. We visited Fincas Los Altos, Mama Mina, and Limoncillo. Mama Mina and Limoncillo are strikingly beautiful. The minute we hit the off-road sections, we jumped in the back to stand. It’s much more comfortable and we can see so much more. It’s really fun! After a late lunch, we head back to the Beneficio to cup some more coffees. We sampled a few coffees from a Honduras farm Erwin purchased a couple of years ago. They were early harvest, but showed very well so we are looking at getting some of those in a couple of months. This entry was posted in Caffe Ladro on February 17, 2015 by Caffe Ladro - Ladro Roasting. Coffee lovers need easy, quality brewing methods to get them out the door in the morning. We’re sharing our favorite methods and recipes for your morning cup. To brew at home, ideally, you will want whole bean coffee (we recommend all our Ladro Roasting Classic blends and Daring single origins), a grinder, a brewer, and a scale, in addition to a teapot or sauce pan for heating water. All the recipes below require that you brew on a scale, with the exception of the 8 Cup Brewer. With so many options, home brewing can seem overwhelming. Hopefully, our recommendations will guide you to a method you like and coffee you enjoy! All the brewers we mentioned are available at CaffeLadro.com, as are scales, filters and kettles should you want to set up or expand your home coffee bar. Are you a coffee drinker who brews one or two cups each morning? 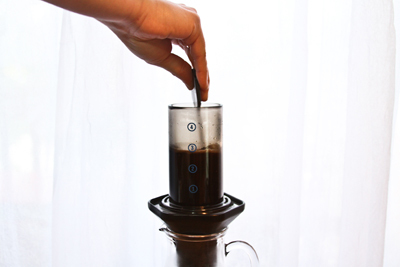 The AeroPress is a great way to brew at home because of how quick and easy it is to use. To make a great cup of coffee with this brewer, follow the steps below. Another single cup brewing option is the Clever Dripper. This brew method combines a filtered drip cone with a stopper, allowing control over the coffee’s brew time. The light-weight design makes it perfect for those on the move. 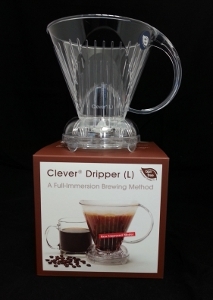 We recommend the Clever for beginning and advanced home coffee brewers. The instructions for how we would brew it follow. The final single cup brewer we recommend is BonaVita’s Immersion Dripper which makes excellent coffee or tea. Porcelain sides keep your water hot as you brew and the adjustable stopper allows you to control the level of extraction. The design brews up to 16 ounces at a time while retaining the full flavors of a single-cup brew. If the brew takes longer than 30 seconds to draw down your grind may be too fine. If the brew draws down quicker than 30 seconds your grind may be too coarse. When brewing coffee for two or more people, you might find the following methods become your favorites. 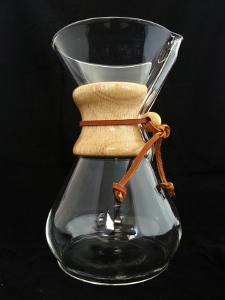 With a wooden collar to make holding the sleek glass brewer comfortable and safe, the Chemex Brewer makes up to eight 5-ounce cups of coffee. Couples, families, and offices find this coffee brewer a beautiful addition to any coffee bar. The functional and modern design places the Chemex brewer in the Museum of Modern Art in New York, NY. The following recipe will provide you with a perfect brew. The BonaVita 8 Cup Brewer is extremely easy to use! The glass-lined thermal carafe will take your home brewing to the next level. The heater raises water to the ideal brewing temperature. The brewer’s shower head completely saturates coffee grounds for the perfect extraction every time. If you want easy and perfection in every cup of coffee, we think this brewer will make your morning! If you prefer tea, brewing tea is super easy with the BonaVita Immersion Dripper! One of the most important variables with brewing teas is matching the water temperature to the tea you’ve selected. White and green teas have delicate leaves, and therefore require below boiling water temperatures between 160 and 175 degrees Fahrenheit (71 – 77 degrees Celsius). Temperatures higher than those will cook the leaves and ruin their delicate flavors. Oolong teas should be brewed at temperatures between 180 and 190 degrees Fahrenheit (82 – 88 degrees Celsius) for best results. Black and Herbal teas brew best at full boil temperatures between 208 and 212 degrees Fahrenheit (97 – 100 degrees Celsius). With your tea matched to a recommended brewing temperature, follow the ratios above and the steps below to make your tea. This entry was posted in Caffe Ladro on February 4, 2015 by Caffe Ladro - Ladro Roasting. Happy Holidays from Caffe Ladro! The finest collection of quality coffees. Roasted only once a week to ensure freshness, this incredible collection of coffees is only available through the end of December. Order online today and choose your preferred roast date. Need a gift for the coffee drinker who has everything? They don’t have these coffees. Boom! The holiday season is in full swing and our bakery’s ovens seldom cool down. Pumpkin Pie and Apple Pie are available now in stores as well as for wholesale orders. Pecan Pies are available for wholesale orders only. Our Pecan Pie is the perfect, delectably gooey addition to any celebration’s table! Available as a deep dish pie, it’s studded with whole pecans and stuffed with flavor. Ingredients: whole pecans, brown sugar, egg, corn syrup, corn starch, salt, butter; (crust) butter, flour, salt, sugar. Call our bakery (206.938.2271) today and let us know what we can get started for you! We request at least 48 hour advance notice for orders. Please note: cutoff times for orders before Christmas are 12pm noon Monday to pick up pies in stores that Wednesday and 12pm noon Tuesday to pick up pies in stores on Christmas Day. Please see our website for holiday hours. A blend of Fair Trade Organic Central and South American coffees, darkly roasted to warm you during the cold winter months. Packaged in a reusable tin, this is a great gift for any coffee drinker! This entry was posted in Caffe Ladro and tagged bakery, coffee farm, direct trade, donation, El Salvador, Fair Trade Organic, fireside, Free Shipping, Happy Holidays, pies on December 1, 2014 by Caffe Ladro - Ladro Roasting. We chose two coffees for this year’s Fireside blend. Peru Norandino is a full-bodied coffee with notes of pepper and cinnamon. Nicaragua Segovia is a lively, sweet coffee with distinct vanilla bean. Together in a darker roast, these two coffees make up what we think is the best Fireside yet. Smooth, creamy, and with a warming spicy note that is perfect for those short autumn and winter days. Peru Norandino is sourced from Cooperativa Agrícola de Servicios Múltiples Norandino. Coffee producers receive training and technical assistance in land management, irrigation, organic farming, productivity, quality control, and reforestation programs. Norandino also seeks to improve the quality of life for coffee producers and their families through projects promoting commercial diversification. Nicaragua Segovia is shade grown in the Segovia region of Nicaragua by members of PRODECOOP, a cooperative of over 2000 families. We hope you enjoy this year’s holiday roast as much as we do! Our bakers are ordering more flour and sugar these days as they gear up for some truly delectable holiday pies! Pumpkin Pie and Apple Pie are available now in stores as well as for wholesale orders. Planning a party, need a dessert for your table, or just want something a little extra special this weekend? We’ve got you covered! Our Pumpkin Pie’s rich, creamy filling is the best sort of autumn cheesecake. Available in either 10-inch or deep dish. Ingredients: pumpkin, sugar, egg, cream cheese, cinnamon, nutmeg, cloves, ginger, vanilla; (crust) butter, flour, salt, sugar. Our Dutch Apple Pie features Washington grown apples. Available as both a 10-inch galette and a deep dish, the galette crust is sprinkled in demerara sugar for extra crunch. Ingredients: apples, flour, sugar, cinnamon, nutmeg; (crust) butter, flour, salt, sugar; (streusel topping) flour, brown sugar, cinnamon, butter. Call our bakery today and let us know what we can get started for you! We request at least 48 hour advance notice for orders. Please note: cutoff times for orders before both Thanksgiving and Christmas are 12pm noon Monday to pick up pies in stores that Wednesday. To pick up a pie on Thanksgiving (Thursday), the cutoff is 12pm noon Tuesday. When you need your coffee to go, our stainless steel mugs and tumblers are your solution. The Ladro Contigo travel mugs with push-button open and release auto-seal keep your coffee so secure, you’ll never worry about spilling again. Our stainless flip-top, double wall tumblers are incredibly leak-proof and available in a variety of sizes to suit your short, tall, or grande order. All our travel mugs do an excellent job of keeping your beverage hot or cold, whichever you prefer. They also make thoughtful gifts for commuters and travelers! This entry was posted in Caffe Ladro and tagged Free Shipping, holiday, pie, pumpkin, travel mug, tumbler, washington apples on November 14, 2014 by Caffe Ladro - Ladro Roasting.